for a “sunday” at least that is. my mind was filled with thoughts of children from 3rd world countries all night and i guess i woke up inspired to do something about it. we watched slumdog millionaire last night and have been doing lots of invisible children stuff these past few weeks and it makes me want to make a change. april has been a good month. a lot going on, but in a good way. escaped most of GMA week, but got sucked into working the actual awards. it wasn’t bad by any means, just a lot more stressful than it needed to be, and a LOT of work. this was my first time working on a live set, so that presented a whole new level of challenges. 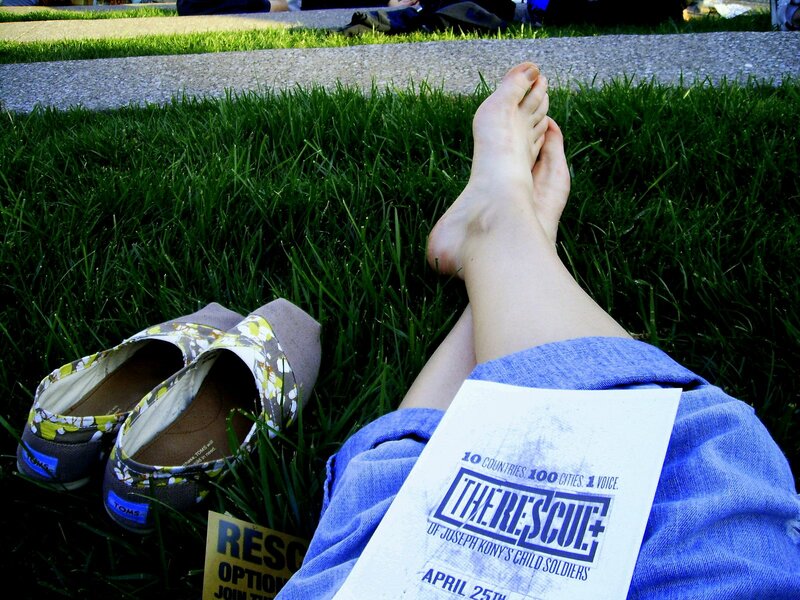 Invisible children had their big event for the year in april too. “the rescue.” 100 cities in 7 countries participated, and the gist was to “abduct ourselves to free the abducted” and demand that a cultural leader “free” us by recognizing us and joining our ranks by using their power to demand something be done to end the war. it was pretty awesome. we all started out at the parthenon in centennial park and marched single file, carrying a sleeping bag, pillow, and overnight supplies and holding on to a rope, and ended at bicentennial mall at the foot of the capitol. we stayed there until we were rescued. *another side note: i had to retreat inside for a few minutes to let one of the blue birds back into its nest. we’ve had a pair nesting ON our balcony for a week and i guess me sitting out there made it too nervous to come back. he kept circling and seeing me and flying off. he had something twice the size of his head in his mouth and felt it was important to have it in the nest, so i gave him his space. can’t wait for those chicks! back to the rescue….its great to feel like you’re making a change; and i think we really are. and the great thing was that i think daniel and i were among the older group of people there; a lot of younger kids are seeing this as something that needs to change, and that makes me excited and hopeful that there are actually some other decent people in this world that are raising their kids with respect and common sense. note my AWESOME TOMS SHOES in the picture; daniel and i both wore our that day and they were quite comfy and held up amazingly…love them! 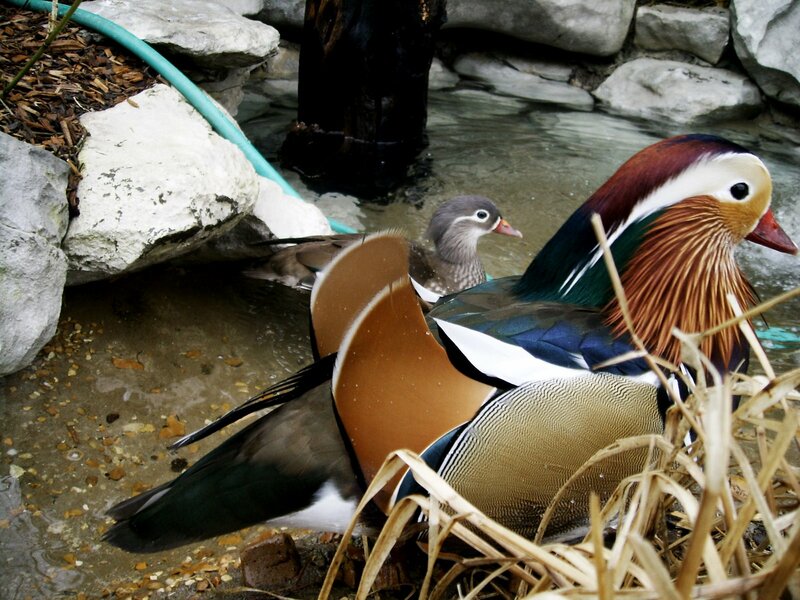 with that, i will leave you with this: a birth announcement of a baby mandarin duck in the aviary. our female laid 13 eggs this year; we had 3 fertile and it seems as if only one made it out okay. i’ll get pictures as soon as i see the little guy or gal. just to get you excited at his or her beauty, these are its parents. excited about that adorable baby duck? Next Post one more thing….